A Darker Shade of Magic is my first V.E. Schwab book, but it definitely won’t be my last. I absolutely love her writing style- and I adore the characters she’s created. Kell is one of the last of his kind – a magician with the ability to travel between parallel worlds. 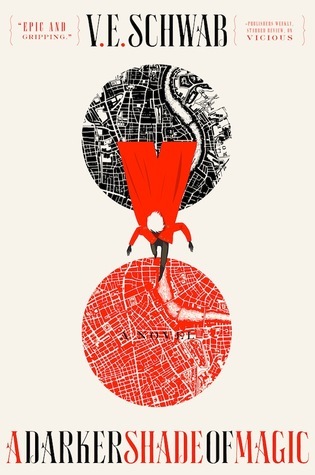 From Grey London (a world without magic – much like our own), to Red London (Kell’s home where magic is revered), to White London (where magic is fought and killed for). There was once a Black London, too. But it was destroyed by magic – and sealed off from the other lands. Kell travels between words as the behest of the Maresh Empire as he carries correspondence between the royals. But, he moonlights as a smuggler, carrying trinkets from one London to the next for those willing to pay. It’s a risky occupation (and considered treason in Red London). When Kell bumps into Delilah Bard, a professional thief in Grey London, she robs him – and then saves him. And, this chain of events makes them partners of sorts in an adventure neither of them were expecting. The world in ADSOM isn’t exactly ground breaking. The idea of parallel words is pretty common ins SFF. And, while the magic system is interesting, it’s not extremely well-developed. However, for a first book in a series, it does what it needs to do: it introduces us to the world and makes us want more. But, the real heart of this series isn’t the plot, it’s the characters. They are wonderful, and flawed, and I couldn’t help but to root for them. Kell has been raised as a member of the royal family, and he considers Prince Rhy to be his brother. But, there is no blood-relation, and Kell knows nothing of his past or his family – nothing before the age of 5. So, he struggles with his identity both within the royal family and the world at large. But, the best part of this book is without a doubt – Delilah Bard. She is smart, and tough, and unbelievably feisty. Delilah is a street-wise cut throat who steals partly to survive, and partly because it’s what she does best. She doesn’t even hesitate to follow Kell into the unknown just for the possibility of an adventure. Because dying doesn’t scare Delilah Bard – complacency does. While the world building isn’t lacking is some areas, Schwab does a great job setting the scene. Grey London feels drab and boring, White London is terrifyingly dangerous, Red London is enticing and magical – and Black London is a riddle you want to solve. This first installment in the Shades of Magic trilogy holds so much promise. We meet some fantastic characters, and get a taste for where the series is going. And I for one, can’t wait to continue. Thanks, now you’ve added another title to my TBR pile! 😄😄😄😄😄 seriously, sounds like a good book that I’ll be looking for! It is amazing – and I just finished Book 2 which was even better. I hope you get a chance to read it soon! Oh no! A second book too?? I can never stop at one in a series. I’ll check it out though. Sounds really good. That’s a plus then! Nothing worse than waiting a year or two for the next book! I just recently finished reading this book too (I’m currently about 200 pages into A Gathering of Shadows and really liking it) and I’m so excited that you are currently reading the series too! Everyone should have this book on their TBR or READ pile, to be honest. The characters are so endearing and I am just slightly worried for most of them because they keep mentioning DEATH and I am like ‘NO. STOP THIS. I DON’T WANT THOSE SENTENCES COMING OUT OF YOUR MOUTH AT ANY POINT.’. Those feel like the worst kind of omens to me! I’m totally with you there! I actually finished Book 2 last night – its amazing – but I’m terrified for what’s to come in Book 3. If anything bad happens to my adorable cinnamon rolls, I’m going to be VERY unhappy with V.E. Schwab. I just want them all to live happily ever after – is that too much to ask for?!?! RIGHT?? Ever since the ending of Allegiant I don’t trust authors anymore when it comes to last books in a series/trilogies. I remember reading the Legend trilogy and being terrified for the fate of the characters! I hope VE Schwab doesn’t add to that kind of pain! Me too! I’m even okay with semi-sad endings, but it has to be done well. However, for these characters nothing but alive and happy will do! I 100% agree. I will probably be reading ACOL constantly crossing my fingers and wishing and hoping things work out for all of them – even Holland. The guy intrigues me! I’ve heard nothing but wonderful things about Vicious! And, after reading this, I can’t wait to pick up the rest of her work. I’ve got This Savage Song on my shelf – and it sounds really intriguing so I’m looking forward to giving that a go! Happy to help! Haha. 😜 I hope you get a chance to pick up one of her books soon! I’ve been wanting to read this! I’ve heard such great things about this whole series. Sounds like a fascinating book! I am definitely adding it to my must read list. Thanks! I’m starting A Conjuring of Light after I finish my current book – I’m so excited/nervous. I just need everything to be okay! Haha. I hope so too. I am not halfway through and I am really hooked. I’ve been a little unsure of whether I should pick up this book, but after reading your review I think I’m going to! I bought this book a year or two ago, read about 50 pages and just kind of forgot about it. After reading your review, I think it’s time to pick it back up!